You may have noticed about Native American Zuni earrings, and jewelry in general, is the colorful nature of the Zuni design. Unlike the Hopi that primarily use only silver, or the Navajo that prominently feature one stone, the Zuni have adapted their stone-cutting to a degree much higher than many tribes and feature that skill in a lot of their work. This ability to refine stones in such a way that they can cluster many of them together is simply stunning. 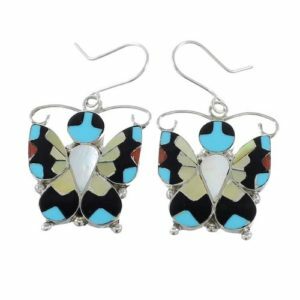 With this style, many Zuni artists can create scenes from the American Southwest or colorful symbols like butterflies and hummingbirds. Color is one of the most important elements to look at when you are looking into Zuni earrings and other pieces. The Navajo also use multiple stones in their pieces, but you will notice that Zuni stones are much smaller and often clustered to produce images or patterns in their pieces that couldn’t be achieved with larger stones. Another thing to look at for Zuni earrings is the stones themselves. Zuni refine the stones in such a way as to show very little of the stones matrix (veins from the mineral deposit). This is a highly prized feature in Navajo jewelry, but Hopi artists don’t like it and tend to cut the stone in such a way that not much of it is shown. Proportions are another important element to keep in mind. As stated above, the Navajo sometimes cluster their stones as well, however, they will use much larger stones set into larger chunks of silver. The Zuni keep their style a lot slimmer in this regard, paying close attention to detail as they cut stone and grind the silver so everything fits properly into its place. When looking for a quality pair of Zuni earrings, make sure to look for a balance of color, smaller proportions, clustering, and lack of the stone’s matrix showing on the piece as well. Copyright © Native American Earrings 2019. All Rights Reserved.